How much is enough then? Well, this really is something that I advise you to think about and to develop a routine that suits you and your dog. Our dogs need to fit in with our lifestyle of course, and ideally your choice of dog would compliment your lifestyle, rather than find yourself with a dog that is constantly in need of fresh air and big runs. This will only leave you feeling guilty, and your dog's behaviour may reflect the lack of exercise if this happens to be the case for you. 1. Ball flinger (what a great invention!) This really works her hard and involves nose-work when done in longer grass. 2. Frisbee (Whilst not quite comp. standard, I'm quite good at this now!) 3. Cycling. Pip astounds me as to how long she can go. 4. Treadmill. I have placed her on the treadmill a few times, but I don't think it's her favourite activity. 5. Freeform agility. This is using natural obstacles that one might find in nature. Log jumps/limbo you name it! Rather like dog Parkour! 6. Running between us as a family. Great to develop the recall, especially if you have a little food to reward her efforts! I do see some dogs that are over stimulated and seem overly hyped. Some collie owners do this as they think that the dog needs to do 100 miles every day. Not so. Any dog should look pretty content once home, and be able to settle within a reasonable time. I have seen good improvements in a number of dogs once the obsessive element of exercise has been prevented for a couple of weeks, and we work on a more relaxing aspect to help bring the dog into a more balanced state. During that time we can look at improving the dog's behaviour by implementing a modification programme. So somehow we have gone from exercise to obsessive behaviour! Enjoy your dog doing what feels good to you and yours. Try to keep control of the game with a decent recall and give (if fetching is involved) and look out for over-exercise. You'll be in a minority if you do, as most dogs are under-exercised...rather like us to be utterly honest. Moderate exercise is the way to go at first, and then build things up gradually for both the dog and for your own sake. What better way to enjoy the great outdoors than to take your dog with you? Exercising with your dog outside will lead you into some serious quality time together, helping to strengthen your bond with the dog, and leave you both feeling great. Dogs, like people, are far less likely to exhibit behavioural problems when they are well exercised, leaving a deep sense of relaxation and calm, whilst being free from anxiety and stress as you bathe in those uplifting endorphins. Depending on the environment you have before you, you can do so many things with your dog when outside. As well as playing fetch with the humble tennis ball, you could stretch your imagination to the Frisbee, cycling together, rollerblading or swimming in the sea together if you live in a suitable climate. The UK is experiencing an interest in CaniX, which is basically running with a dog whilst it wears a harness connected to the handler via a stretchable cord. So which breeds are suitable for such activities? The short answer is that virtually all dogs can be exercised outside in a way that allows them to have fun and remain fit. 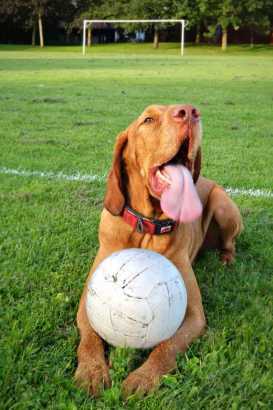 Certain types of dogs will prefer different ways to exercise their natural instincts. Working breeds such as the gun dog group (Pointers, Labradors, Retrievers, Spaniels and so on) or pastoral breeds (Collies, German Shepherds, Old English Sheepdogs) will love virtually all forms of finding and returning an item to you. Introduce entering into the water for the same game and your dog will probably love it. This can be made into a more involved game involving nature's obstacles to introduce agility and nose work to find a hidden item such as a toy you may have planted earlier. The terrier group (Jack Russells, Border Terriers, Airedales etc.) also love to seek items out in hardcover, and are no less adventurous or brave due to the reduced size. The instinct to thrash a toy they have retrieved may leave it in less than good shape, so ensure it is a tough one to play with. All of the above breeds will happily run or walk as far as most people can due to the efficient stride and reserves of stamina. A number of the toy breeds can handle good levels of exercise too. This group includes breeds such as the Bichon Frise, Chihuahua, Papillon, and Pomeranian. Simply downsize the same activities, and many will be surprised as to what a big heart they have. Ideally, a dog should be eighteen months of age before giving it hard prolonged exercise, and a very gradual build up to that point is advisable. If in doubt consult your vet before commencing a fitness programme with your dog. It's important to build the dog up gradually if your dog happens to be out of shape. Give regular easier rest days to begin with, and keep an eye out for lameness or cut pads for example. Dogs will often exercise with little regard for their own safety, and often show a much higher tolerance for pain than humans do. Carry a mobile, and the phone number of your vet. Let somebody know where you're going, and expected time to return. Take adequate food and fluids. Take adequate clothing for the weather conditions. Avoid exercise in excessively hot conditions. As always, feel free to contact me should you wish to discuss this further.